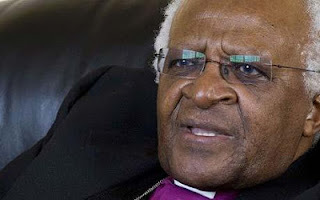 A video message from Archbishop Desmond Tutu on "the role of leadership in the fight against homophobia" caught my attention on 13 December 2012. In the video, the retired Anglican Archbishop, anti-Apartheid icon and Nobel Peace Prize Laureate likened homophobia to racism and highlighted the importance of speaking out against the denigration, arrest, harassment, imprisonment, torture and killing of lesbians, gays, bisexuals, and transgender (LGBT) people around the world. The compelling YouTube video was shared by a friend on Facebook and I thought it wise to share the message, together with my thoughts on the subject, with a broader audience. This is not the first time Desmond Tutu has spoken out against homophobia. He was once asked by a student that if he could have one wish granted to reverse an injustice, what would it be? The archbishop said he would wish for the world to "end the persecution of people because of their sexual orientation, which is every bit as unjust as that crime against humanity, apartheid." [Source] In July 2012, he called for an end to gay stigma to help tackle HIV. It is no secret that homosexuality is [still] a taboo in many parts of Africa and beyond. It is criminalized in many countries, including Cameroon and Uganda. In Cameroon, people are routinely arrested, persecuted and imprisoned on grounds of homosexuality or perceived homosexuality. In 2011, a Cameroonian, Roger Jean-Claude Mbede, was sentenced to 3 years in prison for homosexuality under Cameroon's controversial anti-homosexuality law. Although Roger Jean-Claude Mbede was released provisionally on 16 July 2012, his appeal is still pending and other people like him continue to live in the shadow of discrimination, persecution and imprisonment. In Uganda, an odious anti-gay bill designed to imposed harsher sanctions, including the death penalty, on homosexuality was proposed in 2009. Although the death penalty clause was dropped, the misguided bill is still expected to pass and poses a threat to the rights of the LGBT community in Uganda and beyond. Repressive laws in many African countries are bad enough, but even more worrying is the deafening silence of people of good conscience, especially young people and those with the power to change perception. Many young people either support archaic anti-homosexuality laws or lack the courage and confidence to speak out against homophobia for fear of being accused of promoting homosexuality or fear of being perceived as homosexual (as if only women promote women's rights or only Roma promote Roma rights or better still - as if only victims of human rights violations work for human rights). Many seem to be unaware that the defence of human rights is not about self interest. Imagine a world where people lacked courage to fight against social ills like racism, gender inequality, slavery, colonialism or other human rights violations and prejudices that shame humanity. South Africa would still be stuck in the racist apartheid era and African-Americans would still be disenfranchised and relegated to the back of buses. I am of African descent and I know what prejudice looks like. I know how it feels to be a minority and to be discriminated against. I would not wish it on anyone, including LGBT people. I abhor homophobia as much as I abhor xenophobia, racism, discrimination against women, discrimination against the Roma and other minority groups. I refuse to turn a blind eye on homophobia simply because I am "straight" and not affected by it. It beats my mind that some people can afford to condemn discrimination based on race and at the same time perpetuate or support discrimination based on other grounds. We all have a responsibility to speak out against homophobia and all other forms of prejudices, and to respect the rights and freedoms of all people, without discrimination of any kind.